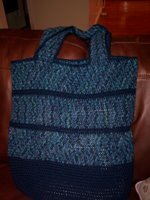 I finished my first — and second! — felting projects. I felted them both at the same time. 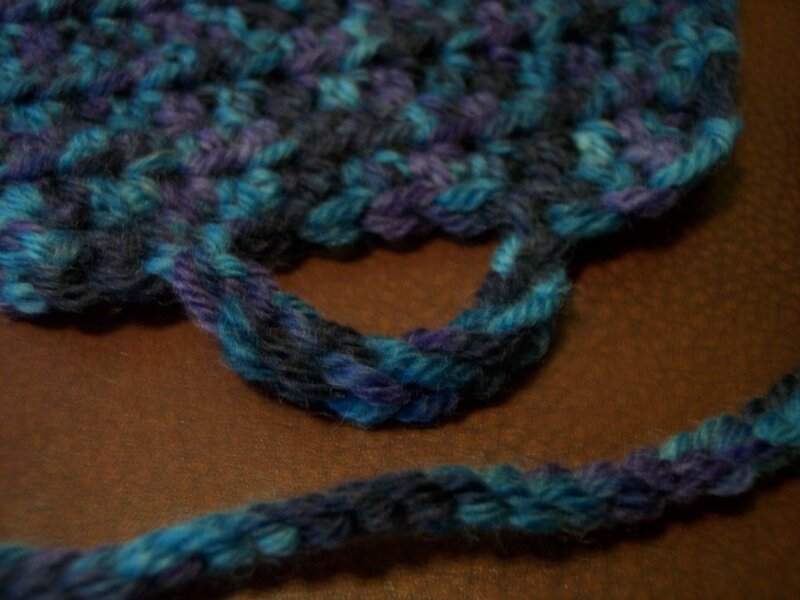 I have to say I'm fairly pleased with the results — not perfect, but awfully dang good for a first try. Especially since I didn't bother to felt a test swatch first! 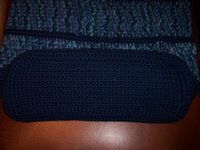 I used a K hook and Lion Brand wool yarn: two 3-ounce skeins of Lion Wool in Midnight Blue and four 2¾-ounce skeins of Lion Wool Prints in Ocean Blues. 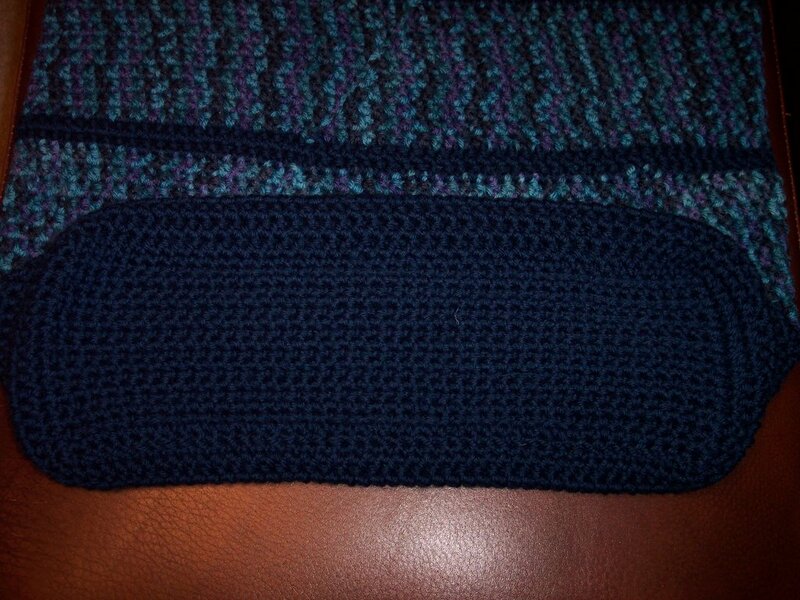 I started by crocheting a rectangle for the bottom in single crochet. Then, for the sides, I worked in the round around the edges of the rectangle, in half double crochet, joining each round with a slip stitch. 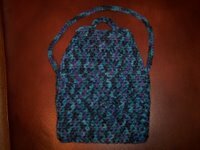 For each strap, I joined new yarn and worked in rows in half double crochet, then fastened off and sewed the loose end of the strap to the top of the bag. 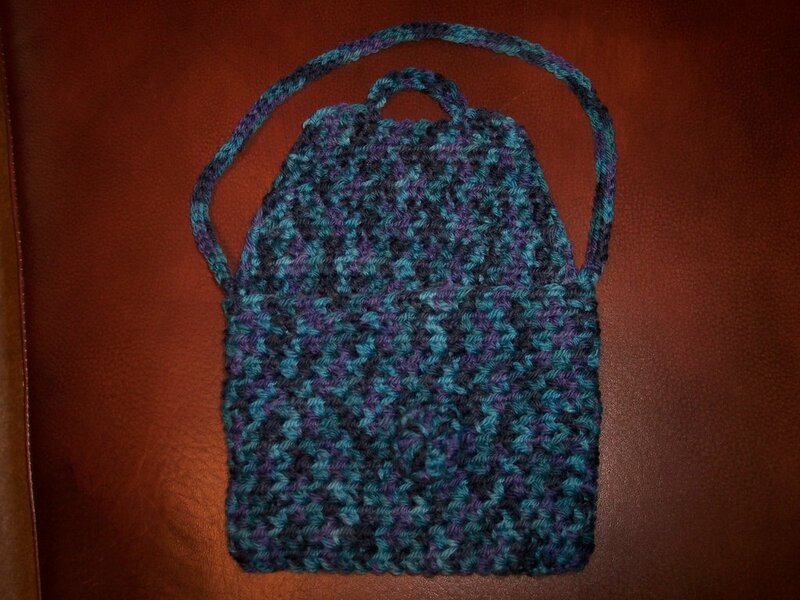 Then I worked one round of single crochet in the solid color around the top edge of the tote and the edges of the straps. 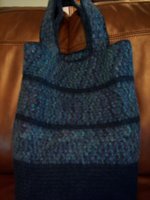 I had just enough of the Ocean Blues yarn left over from my tote bag to make a small purse. Again, I didn't follow a particular pattern. 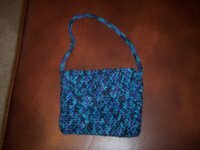 I used half double crochets worked in rounds to make a small rectangular pocket, then half double crochets worked in rows to make the flap. 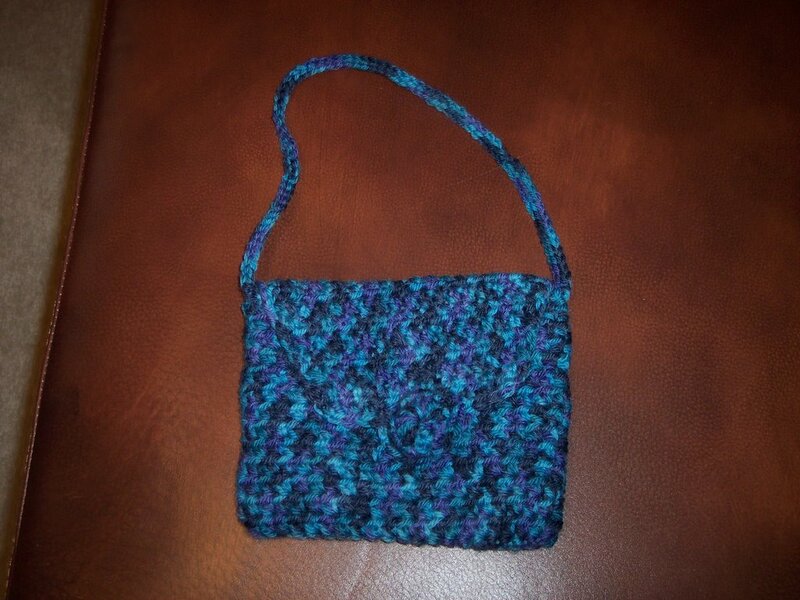 For the strap, I attached yarn to the top edge of the purse, then worked a starting chain, attached the end to the other edge of the purse with a single crochet, then worked slip stitches back across the starting chain. 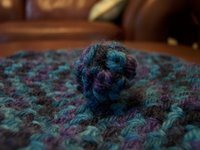 For the button, I crocheted a small circle, then pulled it tight into a ball and tied it onto the front of the bag. 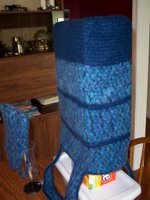 To felt these items, I put each one into its own mesh sweater bag and washed them in my washing machine with four pairs of blue jeans. I used the regular amount of laundry detergent and warm wash/cold rinse. I checked the progress after five minutes and again after another five minutes, but not much seemed to be happening. So I let the whole normal wash cycle finish completely, but still not much had happened. So I started the whole load on another wash cycle, adding the regular amount of laundry detergent again. 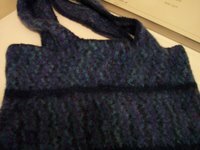 After five minutes of this, I could see some felting beginning to occur, but not much, so I let this whole cycle finish completely. When it ended, the pieces had felted a bit and had shrunk a bit, but they weren't really done, in my opinion. So I sent the whole load on a third trip through the washer, but added only a couple tablespoons of detergent. I didn't even bother checking them during this time, just let them go for the whole time. 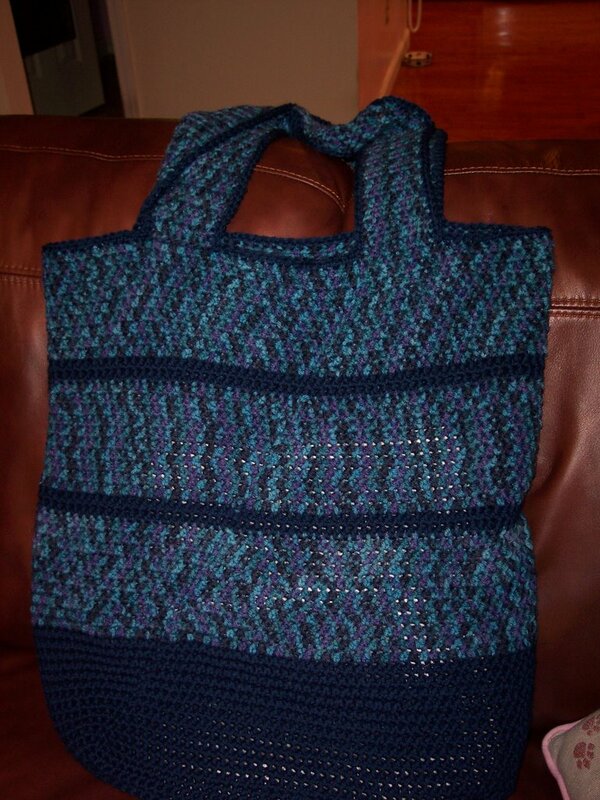 At the end, the tote bag and purse had felted quite nicely and had shrunk quite a bit in the horizontal direction but not very much at all in the vertical direction. My jeans are really clean now too! 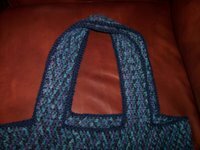 · Bottom rectangle: 15" x 4½" shrank to 10" x 4"
I put the tote bag over a shoe box wrapped in a plastic bag in order to shape it while it dried. 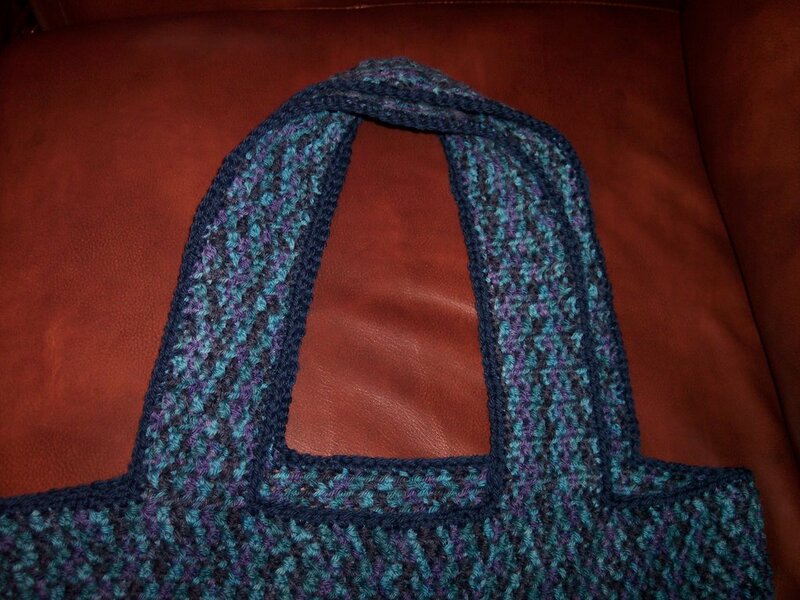 I hung the purse over a wooden spoon to dry. And here are the finished pieces after drying. All in all, I'm calling it a success. And I can't wait to try to felt something else! Whenever I felt, I end up doing several rounds in the washing machine-sometimes a lot of rounds. Love the tote! 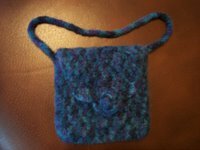 I've never tried felting. Maybe it is time to try.